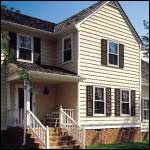 The most common type of siding for a house is wood. Be it cypress, cedar, or redwood, the oldest and most prevalent look good and offer excellent insulation. However, as evidenced by the fact that more and more people are choosing Vinyl, Aluminum, and Seamless Siding, there are a number of drawbacks. Wood in general is a haven for animals and insects. 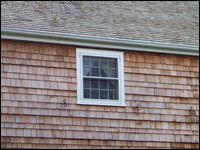 Many woodpeckers and other birds are drawn to the wood on the outside of houses. Know what types of animals and what type of environment your yard is in so you can choose the right type of wood. It is thought that tannin, a resin that is found in Cedar is a natural insect repellent. However, the same tannin can cause rain spots that will appear for the first three years that the cedar is on your home. Redwood is much like Cedar except that its color is slightly different. 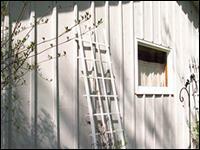 Plywood, which is a common type of siding, is usually composed of Western Red Fir, Yellow Pine, and Douglas Fir. Either roughhewn or smooth, Plywood is usually attached to a home horizontally and isn’t the best way to protect from water damage. However, Plywood is attractive for its natural look, and many ways are being developed to strengthen its structural integrity. Clapboard is simply long boards of wood applied horizontally and overlapping on a house. The result can look uneven and irregular, but beveled or tapered boards can correct this problem. Many people believe that clapboard applied vertically and not overlapping will give an attractive, even look. Compressed wood fiber and adhesives that are weather resistant are applied to planks or sheets of wood to strengthen them and make them more waterproof. Hardboard can measure 16 feet in length, though many people have it cut to better resemble Clapboard. 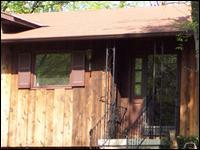 A veneer is a slice of wood of constant thickness, and it is applied to Hardwood to form Hardwood Siding. More durable than indoor plywood, it is also much more waterproof. Rectangular Plank Siding is composed of smooth planks that meet each other evenly. When laid vertically, they form a flat surface that is interrupted only by battens designed to keep moisture out. A rustic, pastoral look can be achieved by using Shakes Siding, which is made up of hand-split, irregular Cedar Shingles. They are rough and either put on all at once or in layers to use weathering as an effect for patterns. They are susceptible to cracking, warping and curling, so they should be checked often and replaced when necessary. Unlike Shakes, Shingles are machine cut, smooth and uniform. They are increasingly overlapped as they are higher on the house, however many people create their own patterns and decide the degree to which there is an overlap. Like Shakes, Shingles can fall victim to warping, cracking, and curling. Wood Plank Siding is very much like Rectangular Plank Siding in that boards are laid vertically and protected from water damage. But Wood Plank Siding comes in many shapes and can be cut many different ways to give texture and a pattern. The types of cuts include V-Groove, channel, rabbeted bevel, shiplap, and drop. Choosing a wood that is appropriate to your area is important to consider before you make your purchase. 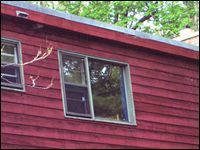 Some birds, like woodpeckers, have been known to punch away at the sides of homes. Should birds make holes in the wood they must be filled or replaced. Any wood, but especially less protected wood like Shakes and Shingles should be kept away from moisture. This means not installing them too low to the ground. If dirt begins to build up around Shingles or Shakes you’ve already installed, clear it from the area so that moisture doesn’t lead to mold, mildew and rotting. These types of wood are susceptible to light that causes them to fade. 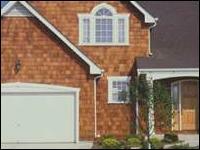 Many people enjoy the look that this creates, but be aware of the way the sun shines on your home. It can cause unpredictable patterns and areas that are more faded than others. You can buy paints or stains that will protect from fading if you prefer the look of the Shingles or Shakes when they’re first installed. Though it depends on your climate and region, a basic rule to remember is that you should re-apply stain every 3 years and repaint every 6 years. Wood Planking has more durability and is more solid than Shakes and Shingles. However, it will have to be painted or stained every few years. It too depends on the climate and weather in your area. Especially in wetter climates, Composition Boards need to be repainted more often than other types of wood. They can’t hold the chemicals that are in paint or stain as well, so it’s important to keep track of when it needs another coat. If Composition Board does go too long without paint or stain, moisture will be absorbed and the board will expand. While wood will settle back to its original dimensions after expanding from water exposure, Composition Board will not. Because of this, make sure that you don’t let water spouts or sprinklers get too close to the boards and keep the bottom of the lowest board 6-8 from the ground. What is difficult about Plywood is that though it expands and contracts similar to other wood, it usually does so at a different rate than the frame it’s attached to. This can cause nails to fall out, joints to bend and structural integrity on the whole being threatened. The goal when maintaining Plywood is to keep expansion and contraction from moisture from happening by regularly staining or painting your siding. Cert-label Only Certi-Labeled products have been inspected and meet the standards for quality, material, packaging and shipping.